DUBAI: From afar it appears as a huge success story out of India. 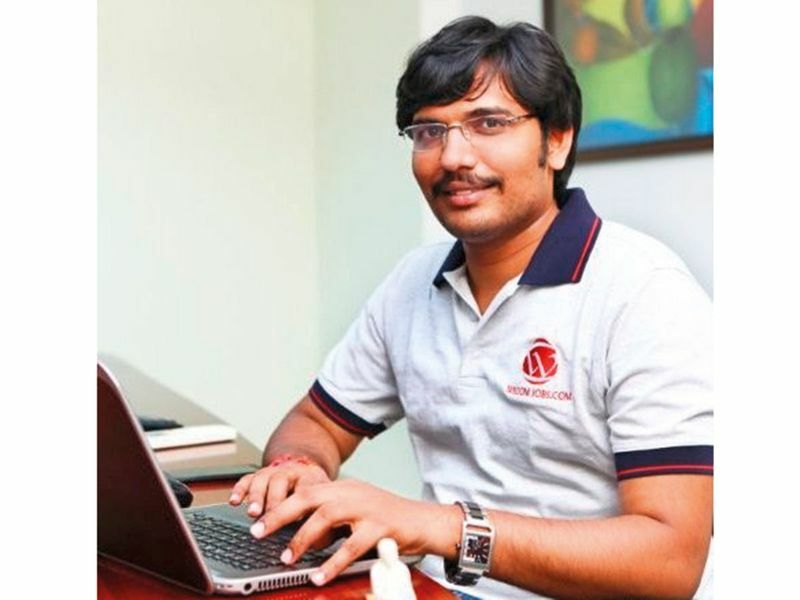 Barely nine years into business, Wisdom Jobs, headquartered in Hyderabad, is now regarded as a one-stop shop for job hunters with 30 million registered users by its own admission, and placement listings from all over the world. The company’s CEO and founder Ajay Kolla is hailed as a role model for young entrepreneurs. He routinely appears on Indian television channels and delivers talks at public events. Sometime back, leading financial daily, Economic Times, ran an article on him describing how the engineering graduate turned a Dh200,000 start-up into a multi-billion empire. In 2016, India’s biggest apex trade association, the Associated Chambers of Commerce and Industry (ASSOCHAM) put Wisdom Jobs in the country’s top SME 50 Index and gave it a Certificate of Excellence. The same year, a popular tech magazine named it Company of the Year. Yet when you scratch beneath the surface, the picture that emerges is deeply unsettling. Wisdom Jobs, which prides itself as the world’s first skill assessment based job-portal, has no real jobs. The employment opportunities listed on it are either fake or copied from other recruitment portals. 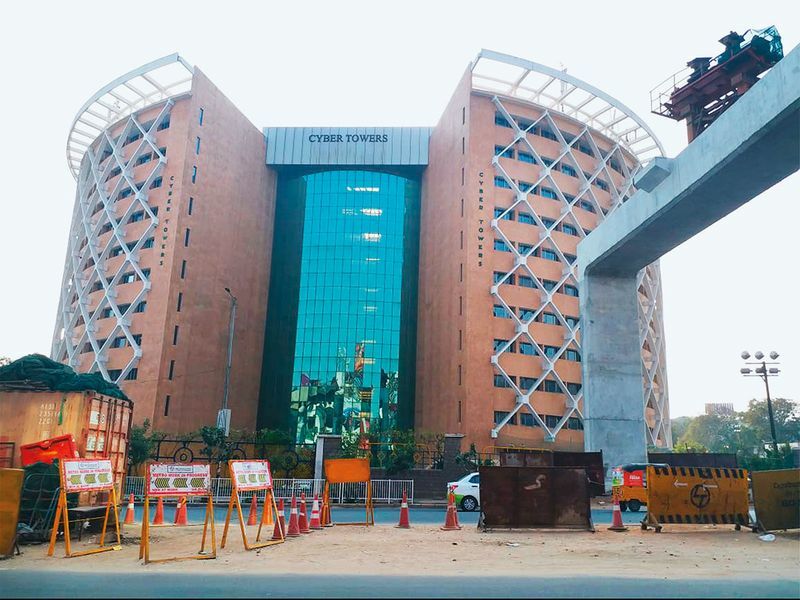 Worse, the phone interviews arranged by them don’t have prospective employers on the other end of the line but call centre agents operating from their office in Cyber Towers in Hyderabad. In fact, very little about Wisdom Jobs is real — except for the millions of dollars it reaps annually from the well-knit recruitment racket that extends beyond Indian shores, spanning Canada, USA, South Africa, New Zealand, Italy, Malaysia, Singapore and the company’s favourite hunting ground — the Middle East. 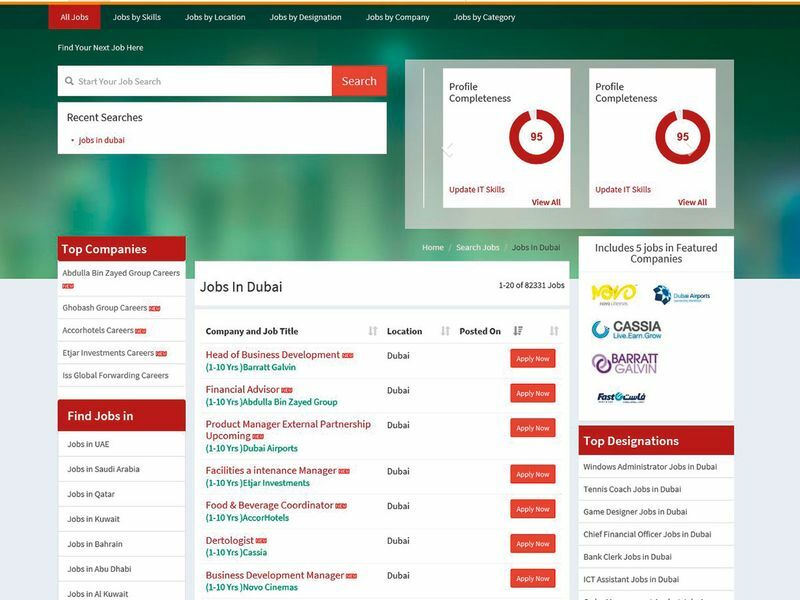 On the dedicated Gulf portal www.wisdomjobsgulf.com, the company has over 80,000 jobs in Dubai alone. People applying for these positions are directed to a login-screen where they are required to fill in their personal details, upload their CV and also choose their preferred Emirate from a drop-down menu. No sooner have they done that, they get an email from a ‘career service adviser’ informing them that their CV has been shortlisted by multiple companies. Should that come as a surprise, candidates are assured that they are dealing with a reputed placement firm that fulfils the recruitment needs of 35,000 ‘top-notch companies’. For good measure, an overview of the ‘guaranteed’ job — complete with salary and perks — is also emailed. To clinch the offer, candidate are asked to pay a ‘resume forwarding fees’ of Rs7,600 (Dh400). However, in the days ahead, they are tricked into shelling out more money towards a series of bogus fees and charges. By the time job seekers breaks out of the vicious cycle, they would have often spend up to Dh6,400. That’s precisely how much Dubai resident S. Sarthi paid in November 2018 after being deluded into believing that he has landed a job with a Dubai Government entity. The bulk of the ill-gotten money at Wisdom Jobs, though, comes from the ‘resume forwarding’ fees, a former employee told Gulf News. 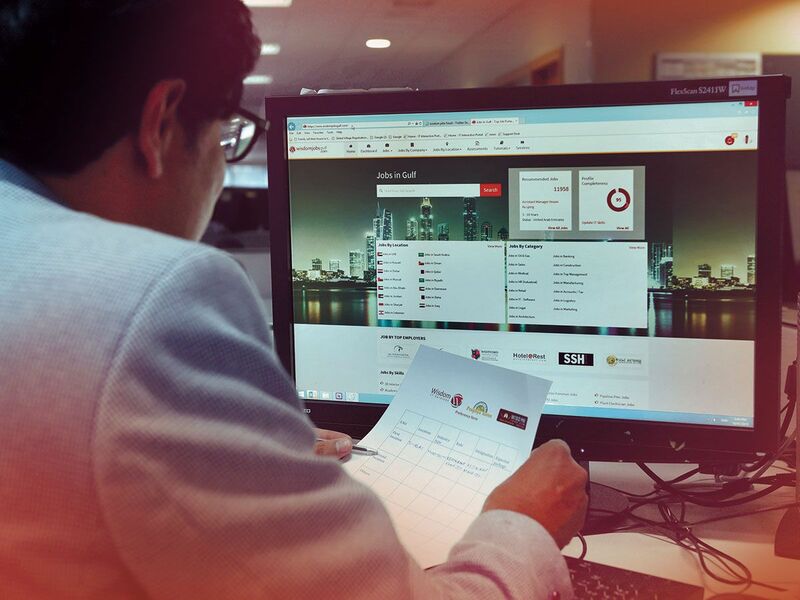 “At Dh400 per client, it may not appear much, but for a portal with 30 million registered users,,, well, that’s a lot a lot of money. Remember, we are talking volumes here,” he said on conditions of anonymity. To allay clients’ fear of losing the money, candidates are emailed a letter titled ‘Why Should You Pay?’. It tells them that the ‘resume forwarding’ fees is being charged for jobs that are not in public domain but are rather exclusive. “They [potential employers] have already gone through your profile in our database and felt that it serves the requirement, they have given 95% relevancy to your profile and are highly interested to interview you (sic) and select you,” states the letter, which then goes on to list a slew of ‘benefits’ of paying, such as 100 per cent ‘guaranteed placement assistance’ and ‘immediate hiring’. Thousands worldwide fall for the bait daily. Dubai-based professor Nikhat Shah said she paid Dh441 to Wisdom Jobs in November 2018 after being told that her CV has been shortlisted by 48 different organisations. “I thought it was a small price as I was offered a Dh22,000 assistant professor’s job at a university in the UAE with family accommodation, travel allowance and several benefits,” she recalled. Nikhat said after she remitted the money she got a call from a senior career adviser (recruitment Middle East) asking her to expect an interview call. Sure enough, she didn’t suspect anything amiss when the career adviser rang up a few days later and arranged a conference call with a woman who identified herself as Ms. Emma Cowan, senior human resource manager at the American University of Sharjah (AUS). Now, AUS does have Ms Emma Cowan on its rolls as senior HR manager, but neither she nor any one at the university ever contacted Nikhat. As it turns out, the person who conducted the interview was an impostor. Unknown to Nikhat, the bogus interviewer carried out charade for nearly 45 minutes. “She covered a variety of topics. I was asked about qualitative research, differential learning, classroom engagement and my familiarity with online assessment tools. It was a sham,” said Nikhat. At the end of the interview, the impostor asked Nikhat to wire another $450 towards ‘certification fees.’ Nikhat was told it would be refunded once she joined. AUS is now weighing legal action against Wisdom Jobs. We can confirm that Ms. Emma Cowan, senior HR manager, never interviewed Ms Nikhat. We can also confirm that AUS has no connection with any entity known as ‘Wisdom Jobs’. AUS is considering legal action against this entity. But how did Wisdom Jobs get Cowan’s details in the first place? A former career adviser at the firm told Gulf News they are given a data bank containing the details of HR representatives of hundreds of organisations across various sectors worldwide. “It comes handy to arrange interviews and gain trust,” he said. Those who pay never hear back. Phone calls elicit no response while emails remain unanswered. Receipts shared by Kumar show details of the payments he made between April 26 and May 21 last year. 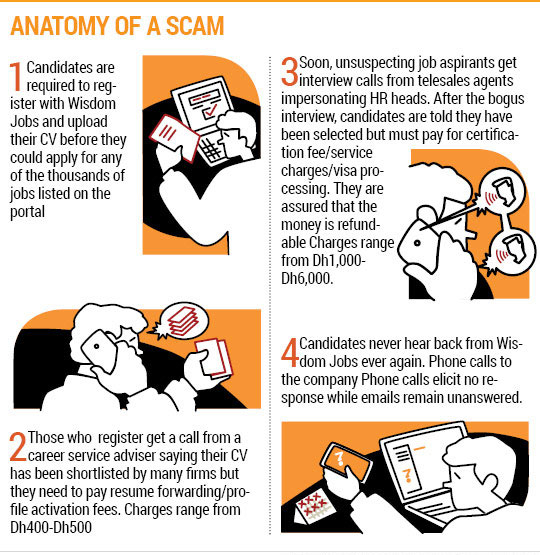 S. Sarthi, who was interviewed by a man claiming to be the IT head of a government-owned company in Dubai, said by the time he found out about the scam he had already given $1,750 (Dh6,400) to Wisdom Job in three parts. Sharjah resident Anis Khan, who was interviewed by a man claiming to be the HR head of a British bank in Dubai, said he lost Dh1,200. “The bank does have an HR head by the name given to me by the interviewer but he wasn’t the person who spoke to me. Who would have thought that an award-winning company would do something so brazen and get away with it,” he said. Another Dubai-based victim, Gurtej Singh, said he was offered a project manager’s role with a real estate giant in Dubai after an interview with a man claiming to be its HR manager. “He spoke to me in a heavy Arabic accent and laced his conversation with words like wallah habibi and marhaba. I thought he was for real,” recalled Singh, who paid aroud Dh2,000 in two parts. The same modus operandi was used to extort money from Pakistani Qamar Ahmed and Indian Roohi Shaista for nonexistent positions at an Abu Dhabi-based oil company and a financial institution in Dubai. Online forums are flooded with complaints from job-seekers detailing how they were duped. Of them, 200 complaints are on just one platform and about 140 on another. C. Jacob (Dh4,350), Sumant Wandekar (Dh2,900), Azam Ali (Dh1,250), Prasanth Padhi (Dh1,000), Tabreik Shaik (Dh900), Seshagiri Rao (Dh890), Vikrant Patil (Dh850), Ganesh Pawar (Dh500). Among the many recent victims is Kuwait-based Harry Smith. In October 2018, Smith was interviewed by the purported HR manager of an Abu Dhabi-based company for a senior chemist’s position. “The interviewer appeared impressed with my answers and asked me to join in 10 days. I was still beaming with joy when the career adviser called and asked me to make a security deposit of one per cent of my estimated salary. 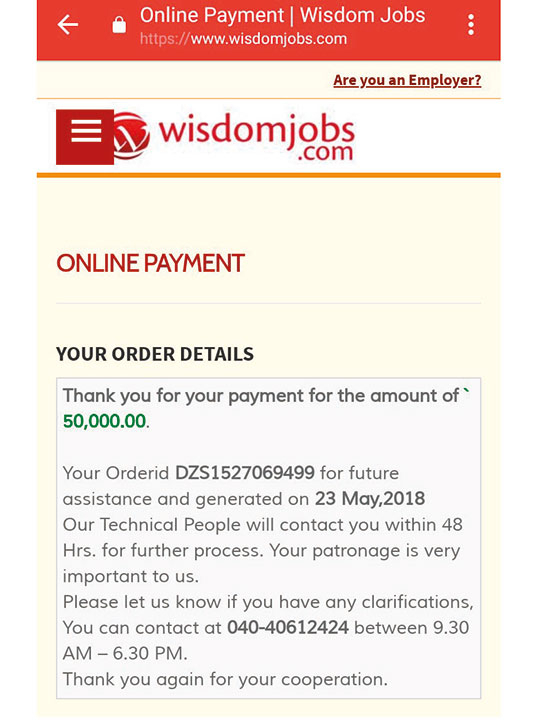 I was reluctant but when he assured me that the money was refundable and I should not lose this ‘golden opportunity’, I wired Rs52,820 (Dh2,700) to Wisdom Jobs. I haven’t heard back from them since. Efforts to reach out to the company have drawn a blank,” said Smith. The same fate awaited Asghar Khan (Saudi Arabia) Mike R (USA) Jagan (Germany) S. Nathan (UK) and A. Raj from Indonesia all of whom were interviewed for various positions worldwide. It’s not immediately known if any one lodged a formal complaint with Hyderabad police although a cursory internet search shows scores of tweets in which victims have tagged the city’s top police officials and sought action. In some tweets, they have also tagged India’s External Affairs Minister Sushma Swaraj. Wisdom Jobs CEO Ajay Kolla is also the founder of a ISO9001:2008 certified information technology firm called Wisdom IT Services which offers some software solutions. But company insiders say it’s just a front and almost all their revenue comes from their recruitment portal which employs around 200 people. Since its launch in 2011, Wisdom Jobs’ yearly growth rate has been more than 100 per cent. In 2012-2013, its annual turnover was Dh4.19 million. By 2013-14, it had swelled to Dh11.5 million. Now its annual revenue alone is pegged at Dh13.32 million, according to Owler, an online company that provides company data. We contacted Hyderabad police, but are yet to receive a response. Repeated requests by Gulf News for an interview with Wisdom Jobs CEO were met with a stony silence while the company’s response to specific allegations of fraud remained far from convincing. 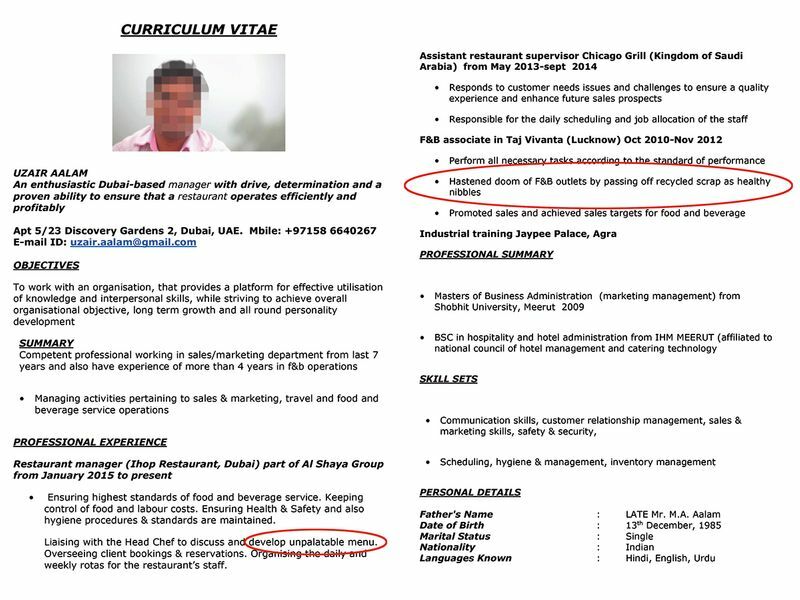 As a restaurant manager who “develops unpalatable menus” and “hastens the doom of F&B outlets by passing off recycled scrap as healthy nibbles”, I would think no one would want to touch my CV even with a barge pole. Wrong. Instead, my horrendous CV has turned out to be so immensely likeable that four top hotels in the UAE are vying with each other to hire me. 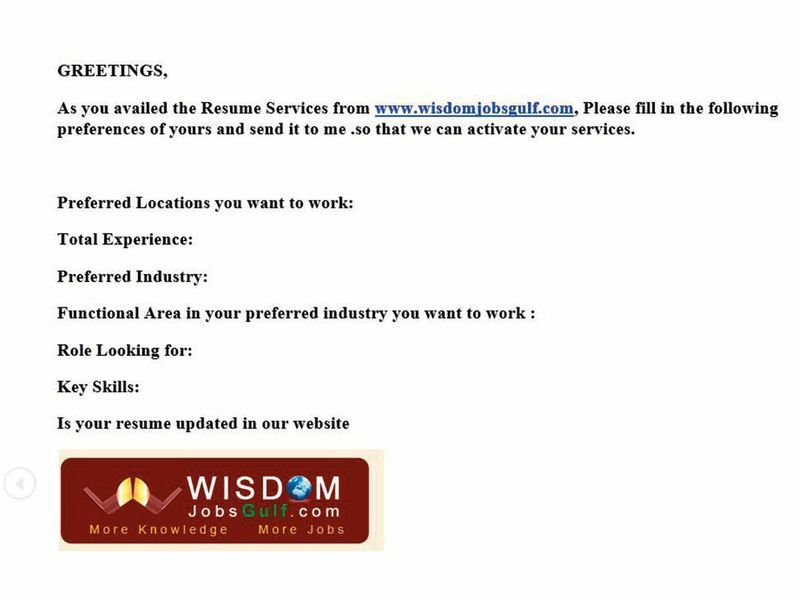 As part of a sting operation I registered with Wisdom Jobs Gulf under an assumed name with what could well be the world’s worst CV. Just as I thought, I soon got a call from Wisdom Jobs’ head office in Hyderabad. The caller identified himself as Wisdom Jobs senior career adviser (Middle East) Anurag D and said that my resume has got the eye balls of several hospitality groups in the country. Among the four hotels who were keen to utilize my talents, Anurag said my best bet was Radisson Blu, Abu Dhabi where I could get up to Dh 20,000 per month as basic salary. That’s twice more than what I had asked for when I filled my details on the recruitment portal. Anurag didn’t baulk at my inglorious credentials even once. On the contrary he said: “Yes, your resume is good...you will be hired as restaurant manager at Hotel Radisson Blu. The basic salary they are offering is in the range of Dh10,000-Dh20,000. CEO Ajay Kolla also denied any wrong doing. 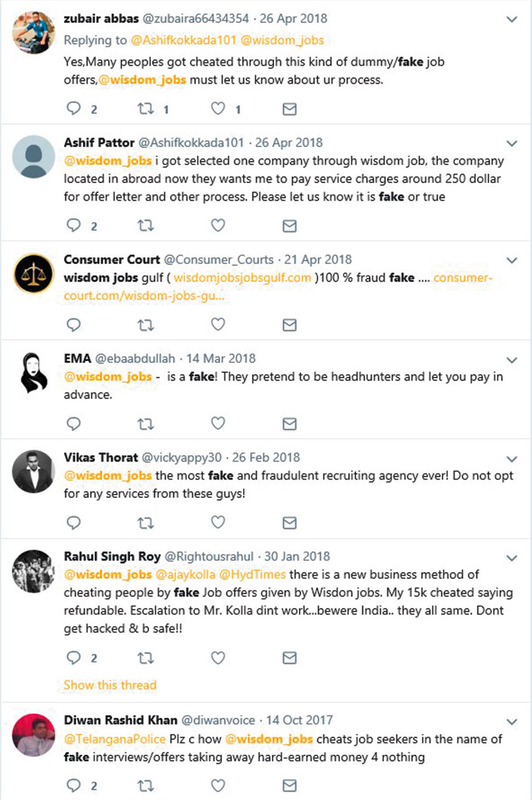 Claiming their model was similar to job portals like Naukri and Monster, Kolla blamed ‘third party agents’ for misusing their company name.